It's all about caring for your child. Some babies, particularly if they're breastfed, need to eat every two to four hours around the clock until they're several months old. If your baby is still waking to eat at 6 months, begin to wean him off night feedings by rousing him 30 to 60 minutes before his usual feeding. Each night, reduce the amount of time you breastfeed by one to two minutes a session; when you get to two-minute feedings, don't wake your baby and he should sleep through the night. If your baby takes formula, eliminate 1 or 2 ounces per night feeding. 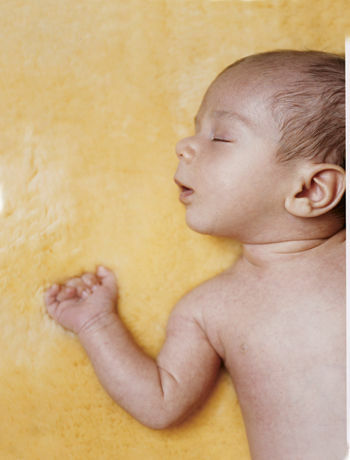 Beginning when your baby is approximately 3 months old, encourage regular nap- and bedtimes. Institute routines that are consistent, predictable and calming so your child starts to learn what is coming next: sleep.